Earlier this year, a friend of mine bought an expensive High Definition Video camera. He had saved up for it for a long time. In stead he could have bought a second hand Subaru. But he doesn't care he doesn't have a car. He has a dream. The Australian Dream. Australia is a hands-on type of nation. When I arrived in 2001, it didn't take me long to get my first short film off the ground. So many wonderful people, eager to get their hands dirty and help me out. After all, filmmaking doesn't have to be the cumbersome, expensive art it used to be. In a way it is still cumbersome but the essentials to capture and reproduce images have become so cheap they are now within reach of anyone with a job or a credit card. The largest short film festival in the world started in Sydney. Meanwhile Tropfest has spilled out to all major Australian cities and even the rest of the world . The fact it started here in Australia is no coincidence. When an Australian wants to do something, he doesn't first sit down to ponder about how it is usually done and then wait for an opportunity to arise so the job gets a bit easier. The Australian goes for it. ASAP. You can hear me coming: despite all the good intentions there is a downside to this "let's just do it" attitude. In the case of filmmaking, I cannot shed the impression the Australian believes there are shortcuts. What is the easiest way to get your idea on the screen? You hire or buy a video camera, get some mates to stand in front of it and "just do it". We are all made to believe this is how it works. Practical guides to the use of digital equipment make it seem like child's play. It is an illusion that has cost us dearly in recent years. I have seen a fair few movies lately that were all made with lots of enthusiasm but not a lot of thought gone into the screenplay. What is it with movies that people just cannot stop believing the illusion? At this point I must add that what sets my friend with the HD camera apart from the crowd, is this: he had first invested a significant amount of money in learning the craft of screenwriting. "I have about 3 ideas for scripts, they would be produced entirely by my friends and I. I need to put the first drafts down I am trying to round up a script writing program to make it easier." "If your dream were to compose music, would you say to yourself: "I've heard a lot of symphonies... I can also play the piano... I think I'll knock one out this weekend? No. But that's exactly how many screenwriters begin: "I've seen a lot of flicks, some good and some bad... I got A's in English... vacation time 's coming..."
The essence of story is not rocket science. I keep repeating: it is a learnable skill. But a skill that must be learned nonetheless. What you cannot learn is the inspiration, the need to tell a specific story. Yet so many people with the desire to tell that story believe they can get away without properly mastering the craft. They want to build the house without a notion of engineering. They want to compose a symphony without knowing a C from a Cis. They want to serve a bouillabaisse but can't even cook a ratatouille. "I guess, that you can break the rules and still get away with it." Having recently caught up on some Australian films of the past few years (see my previous post) and listening to feedback from others on more recent films (Clubland, West, Suburban Mayhem etc.) it seems these pictures are unable to connect with a mainstream audience. Or any audience, for that matter. It's no longer an issue of getting the audience into the theater, if those who saw the films are not entertained. There are strong indications the problems don't lie in the execution but in the bare essentials of story. Yep, they are breaking the rules. But where did things start to go wrong? 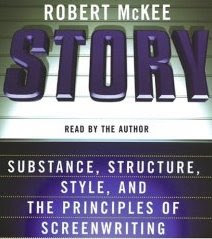 I believe the lack of understanding of the principles of story has become endemic for our entire industry. Not only do writers lack the skills: producers and funding decision makers fail to see the flaws in screenplays. As long as the 'elements' are in place, the film will get made. The 'elements' being: cast, technically experienced crew, government funding etc. On the government's role: while preparing development notes for a government funding application, a particular paragraph in the guidelines struck me. "What is the point of view (POV) of the script? That is, where is the audience positioned in relation to the script? Are they close to one central character? Is it an omnipotent POV?" An "omnipotent POV"?? Somebody has lost the plot here. Point of view is crucially important in a story. The terminology should be second nature to anyone even remotely involved in screenwriting, let alone the funding of it. If even the funding agencies cannot get their act together, why would anyone expect the writers would? Interesting to note that the same funding agency has been reported to have feature drama screenplays assessed by documentary film makers. Go figure. Recently a young filmmaker submitted a rough cut on DVD with an application for post-production funding. The application was rejected. The assessor didn't like the film? Correction: the assessor didn't like the screenplay. The rejection was justified in a multi-page assessment of the screenplay. The assessor did reference the DVD but the brunt of his tirade was directed at the script.